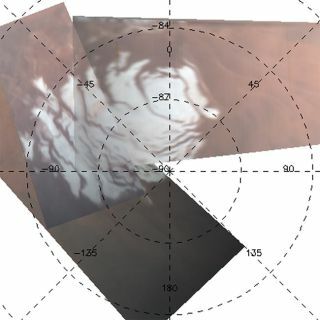 This mosaic of images taken by an instrument aboard ESA's Mars Express shows the residual south polar cap at the end of the northern winter on Mars. Planetaryscientists have discovered new details to explain a mysterious seasonalasymmetry of a Martian polar ice cap. Like Earth,Mars has frozen polar caps, but unlike Earth, these caps are made of carbondioxide ice as well as water ice. During the southern hemisphere's summer atMars, much of the ice capsublimates, a process in which the water ice turns straight back into gas,leaving behind what is known as the residual polar cap of mostly carbon dioxideice (what we know as "dry ice"). While thewinter cap is symmetrical about the red planet's south pole, the residual capis offset by some three to four degrees. Scientists had proposed oneexplanation for this puzzling misplacement in 2005, suggesting that more snowfell in the polar region's western hemisphere during the winter. In that way,during the summer and spring seasons, some of the surface snow would remain onone side of the pole. But now newdetails about the Martian weather suggest a slightly different mechanism forthe wonky ice cap. The complex answer involves an odd interaction between wind,snow and the sun. The newstudy relied on information gleaned from the Planetary Fourier Spectrometeronboard the EuropeanSpace Agency's Mars Express spacecraft. MarcoGiuranna of the Istituto di Fisica dello Spazio Interplanetario CNR in Rome, Italy, and colleagues measured temperature and other conditions of the Martianatmosphere above the south polar region, along with carbon dioxide accumulationin the southern ice cap. They foundthe offsetting process starts with strong eastward winds at Mars'mid-latitudes that blow straight into the HellasBasin, the largest impact structure on Mars with a diameter of 1,429 miles(2,300 km) and a depth of about 4 miles (7 km). The crater's steep wallsdeflect the winds and create giant waves in the atmosphere, which on Earth arereferred to as Rossby waves. These waves reroute the high-altitude winds onMars and force weather systems toward the south pole. In thewestern hemisphere of Mars, the result is a strong low-pressure system near thesouth pole, and a high-pressure system in the eastern hemisphere, again nearthe southpole. The low-pressure system in the western hemisphere makes for cooler air temperatures. And thesetemperatures are just right for carbon dioxide to condense into snow. Thatmeans in the western hemisphere of the south pole there is a buildup of bothsnow and frost. In thehigh-pressure system in the eastern hemisphere, temperatures are always toowarm for snow to fall, so only frost coats the ground there, Giuranna said. Frost isfound across the south polar region on Mars, regardless of hemisphere. "Duringthe polar night [on Mars] you always have condensation of CO2 on the surface. Icall it frost," Giuranna told SPACE.com. "When CO2 gas touchesthe surface it freezes instantaneously." The storyis not just one of more ice cover (from snow and frost), however. The areasthat have extensive snow cover reflect more sunlight back into space than doesthe surface frost. Grains of frost tend to be larger than snow grains and haverougher surfaces. With such rugged texture, the frost traps more sunlight,driving the sublimation. So thewestern area of the southern polar cap, built of snow and frost, not only has alarger amount of carbon dioxide ice deposited but also sublimates more slowlyduring the summer. The western area built of frost disappears completely. This explainswhy the residual cap is not symmetrically placed around the south pole, theresearchers said. Theresearch is set to be published in a forthcoming edition of the journal Icarus.